Creating daily and weekly lessons plans is an essential part of a teacher’s job. Organizing concepts, key points, and new skills into a clear and concise plan ensures that you are able to teach all the required material in the required amount of time. While this may seem like a simple task, creating lesson plans can be a frustrating and time consuming process without some of the proper tools. Use the questions below as a guide to help you see if you’re ready to put your plans together this year. 1. Are you able to cut large chunks of knowledge into more digestible pieces? Text books and lab manuals can be overwhelming to students who feel there is more material there than they can ever learn. Being able to break that material down into smaller, less intimidating pieces takes patience, dedication, and experience on the part of the teacher. Before the start of your semester, go through the information required in each subject and find the chapters or sections that share common concepts. Building off of similar ideas will help you maintain continuity and will make learning easier and more natural for your students. It will also help you identify any underlying principles that need to be taught or reviewed before you get into your material. Being able to break large amounts of information into smaller pieces is an essential step to master on the ladder of effective lesson planning. 2. Are you able to space out material so that key concepts are taught on schedule? Since the school year only has a certain number of weeks in which to teach important principles, being able to lay out plans in such a way that everything gets covered is another essential ability. Lingering too long on some points or speeding through others too quickly will have a negative impact on how much your students can learn. Setting a comfortable and appropriate pace will ensure that you get to teach all the assigned topics without having to rush through anything at the end of the year. Try counting the number of weeks you have in your semester or school year then counting the number of chapters you have to cover before that time ends. Simple math will let you know how many chapters you need to complete each week in order to finish each concept. Be sure to account for things such as school holidays, chapter tests, school assemblies, standardized testing, and any other events that can cut into your teaching time. Laying out your year or semester in advance will help you stay on track and prevent you from running into problematic time delays later on. 3. Are you using the proper tools? • The Morning Routine Planner– This tool is appropriate for elementary grade teachers as it allows you to explore the current weather, go over the seasons, months, days of the week, and practice number skills. Your entire morning can be planned using an interactive white board and this program. Check out this YouTube video to see how this tool works. • The Class Arrangement Tool– This program allows you to use your smart board to set up the floor plans in your classroom. This is an especially helpful tool in lesson planning when it comes to creating groups for chapter reviews, subject projects, test study groups, or art projects. Students can be arranged based on level, topic, or chapter in order to provide an effective learning set-up. 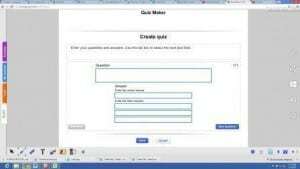 • The Quiz Maker– This tool is also helpful in lesson planning as it allows you to custom craft quizzes and tests based off the material you are covering. If you are working on a longer chapter and feel you need to create a quick review before moving on to the next section, this program lets you ask the questions that will help you assess the progress of your class. Check out this YouTube video to see how this tool works. Using your interactive white board and Gynzy tools will help make lesson planning a more enjoyable process. 4. Are you able to make adjustments to your plans as needed? Unfortunately, even the most carefully created plans can be thrown off by an unexpected fire drill or snow day. Sometimes, even the need for review on especially difficult concepts can create a delay that throws off the schedule you’ve created. Being able to adapt quickly in situations such as these to get back on track is an important skill for every teacher. Since standardized testing still covers the same material regardless of unforeseen lesson changes, it’s essential that you’re able to shift your plans to accommodate any concepts that were missed. If you find yourself in this predicament, look for activities such as worksheets, extra quizzes, or associated art projects that can be cut out of your plans in order to make more room for the necessary topics. You may need to alter a couple of your daily lesson plans until you have caught up with your original schedule to make sure you fit everything in. 5. Do you have the patience needed to create organized and effective lesson plans? Though it may seem like an obvious necessity inside the classroom, patience is something that will benefit every teacher outside the classroom as well. Sifting through the required information for every subject being taught takes time and dedication in order to get it right. Though subsequent years of teaching the same grade or subjects may not be as time intensive in the planning process, the first year or two can be quite demanding. If you start to feel overwhelmed with your lesson planning, focus on your overall goal of increasing your students’ knowledge and preparing them to succeed in life. Knowing that the time you put in now to creating solid lesson plans will only benefit yourself and your class will help you develop the patience you need to see it through to the end.